Realistic Horse Skeleton created for anatomical research and my own personal muscle system development. This horse skeleton is fairly accurate with tons of hours spent into carefully researching every bones and modeled them as precisely as possible, including major bone landmarks. Skeletons tend to be very high in geometry and not animation friendly, but this one is different. Instead of being sculpted and decimated, it was carefully box modeled, 100% quads. Instead of using more loops, I utilized mean creases a lot to have sharper details while keeping the geometry fairly low. The bone material is 100% procedural with UVs, very easy to tweak and also uses dirty vertex color to make the joints darker. The rig is my own custom rig, few bones to animate, super easy to pose and animate. - Model with materials and shadow catcher with animated rig plus awesome fire effect. This rig is perfect to practice animation and also to include in cool shots. Can also easily be decimated to be used in game engines. If you would like to be warned of new updates & version releases, please provide your e-mail upon purchase and please also rate this product after you've purchased it and took it for a test run, thank you! Here is the documentation for all 3 version starting with the Model only version, then the rigged version and then the fire version. This version is perfect for whom like to take a stab at rigging, Also great for museum style scenery. Can also be split to parts and scattered on ground. 01. 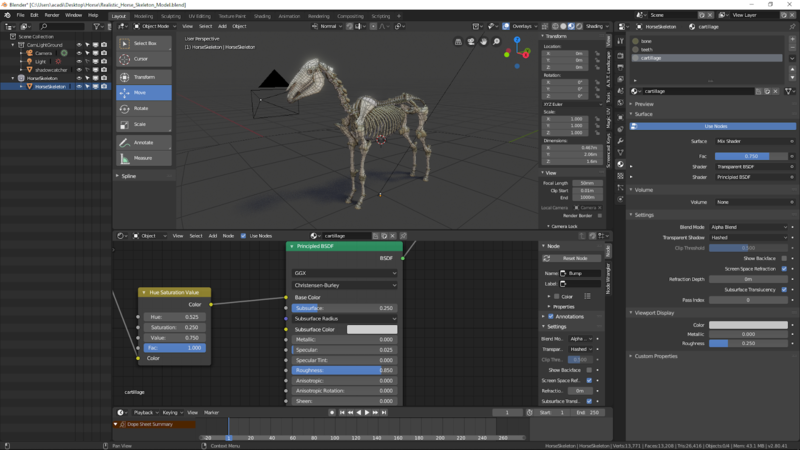 Contains the model of the horse in a natural stand pose with shadow catcher ground and procedural materials for the bone, cartilage and teeth. 02. The shadow catching ground is only a plane subdivided with a faked shadow catching method that works rather well. 03. 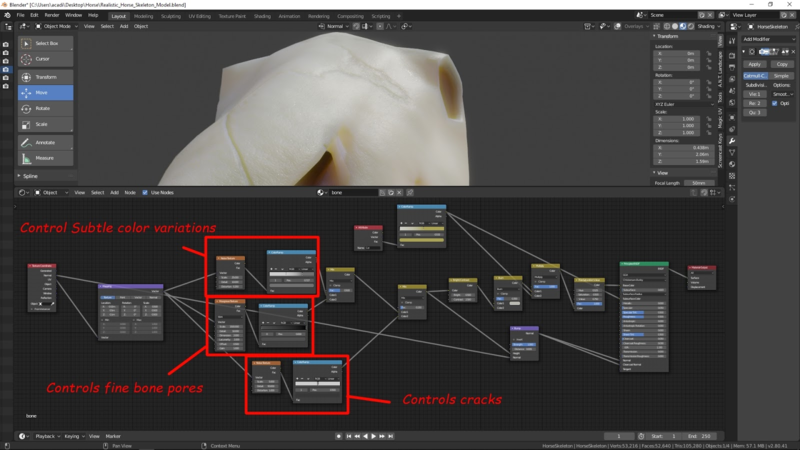 The bone, cartilage & teeth material are all procedural are very easy to edit. 04. The cartilage material is a copy of the bone with added transparency and a variant of color. The teeth material is also a copy but without pores or cracks, with clear coat on and a variant of color. 05. The model by default is at its lowest subdivision. It can easily be decimated for lower polygon count or simply put the subdivision modifier on for higher version! And that is that for this version! This version has the same features then the model only version except its rigged and ready to animate. The rig itself is super easy to pose and animate. 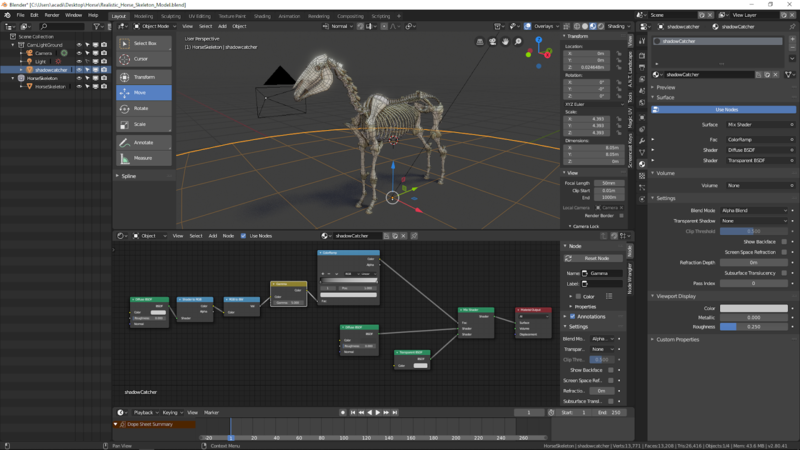 The rig is a full body Inverse Kinematic (IK) style of rigging which is perfect for quadrupeds. 01. Use the world root to place, rotate and scale the rig for your shots. 02. Use the local root for flips and also to make loops move in space. 03. Use the back bone to control the entire spine. 04. Hip bone can be moved and rotated. 06. Use the Upper back target to curve the spine or if you sit a character on it, fake the compression of the spine as well as subtle breathing. 07. Use the lower neck target to quickly lean the horse forward. 08. You can rotate all 3 neck bones. 09. Rotate the head by rotating the head target, can also move the head to lean the horse forward (only the middle neck bone doesn't move, but it can if you unlock its location in the N panel). 10. Use the jaw bone to open and close the jaw. 11. The clavicle bones can be moved and rotated. 12. Use the arms target to pose the front leg and orient the wrist. 13. Use the fingers tip target to control the finger location and rotation. 14. Use the little cube to move the entire leg. 15. Use the foot targets to pose the back leg location and rotation. 16. Use the shin targets to correct the rotation of the shin if needed. 17. Use the toe tip targets to pose the toes location and rotation. 18. Use the little cube to move the entire leg. 19. Use the pole vectors to control the limbs tilt. And those are all the controls for this horse rig. Its really easy to pose and animate. This version has the same features then the model and rigged version except that it has a run loop animation with a nice fire effect. The effect needs to be cached first and takes roughly 20 minutes on my Wacom Mobile Studio Pro 16 for all 463 frames. The turn table animation start at frame 100. 01. The fire effect isn't real time and will most likely crash blender if you try to play it in the viewport. Use with care. You can turn it on an off when needed. Make sure its off to preview the animation. 02. The animation is a simple loop pasted from frame 1 to 463 over and over. 03. The smoke is emitted from a simple hidden object that is rigged to the skeleton. There is also a wind effector as well as a turbulence effector and a domain to simulate the smoke. The skeleton is added as collision the smoke effect. 04. To change the color of the smoke simply select the effect container (smoke domain) and edit the material emit color. And that is pretty much how it all works! If you have any questions, don't hesitate to send me a message via the blender market message link. No, It was created in Blender 2.8 and isn't backward compatible. This version contains my high quality 100% quads only, super clean topology Realistic Horse Skeleton model with all the materials and the shadow catcher ground as well as the super friendly custom rig ready for animation. Also includes an run loop animation with a pretty awesome fire effect. Ready to edit, animate, re-calculate for your own animations and shots.